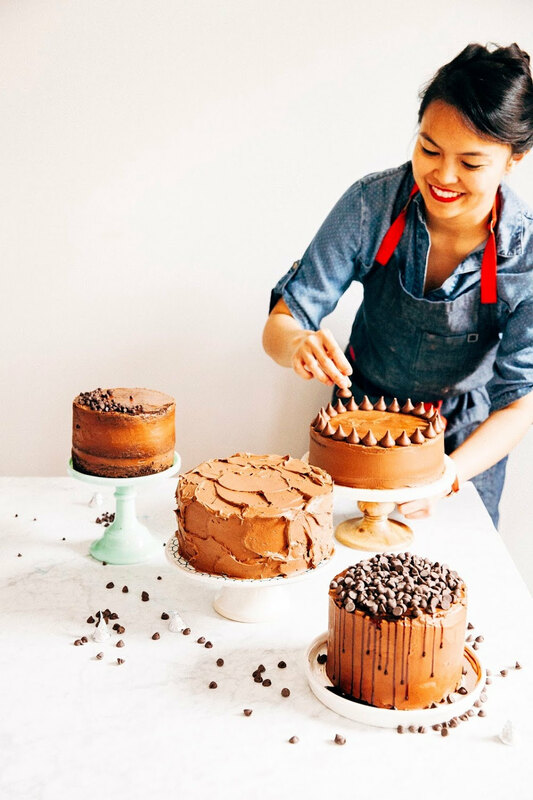 As a completely self-taught home baker, there are certain types of baked goods that I tend to avoid making because they intimidate the living crap out of me. These baked goods are macarons, croissants and... pie. Pie. Yep, the most banal and seemingly harmless of the three baked goods I listed above. But here’s the truth: I’m scared of baking pie. I look at these pictures of pretty lattices and pie crusts and I get sad because I know that I’ll never be able to recreate them. To be fair, I’ve attempted to bake pie exactly once in my life — a long time ago, during my senior year of college. It was Thanksgiving, and me and my few remaining friends in town decided to do a potluck. Being the sweet-tooth of the group, I volunteered to handle dessert: I offered to bring a blackberry-peach pie. I wasn’t much of a baker back then. 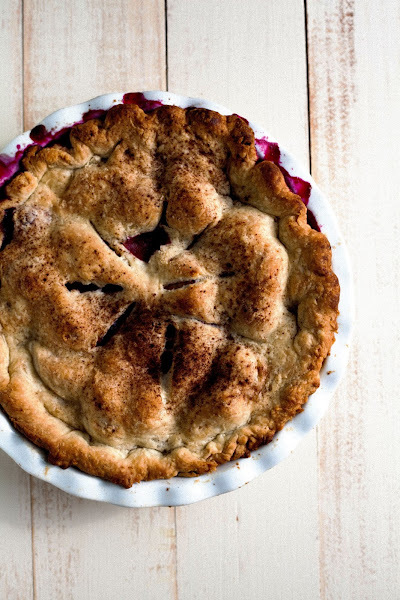 Truth be told, I wasn’t much of a food person back then either — because why would I volunteer to bake a blackberry and peach pie in the middle of November, when neither fruit was in its prime or even in season? But back in the day, I wasn’t as mindful about cooking with the seasons and using fresh ingredients. 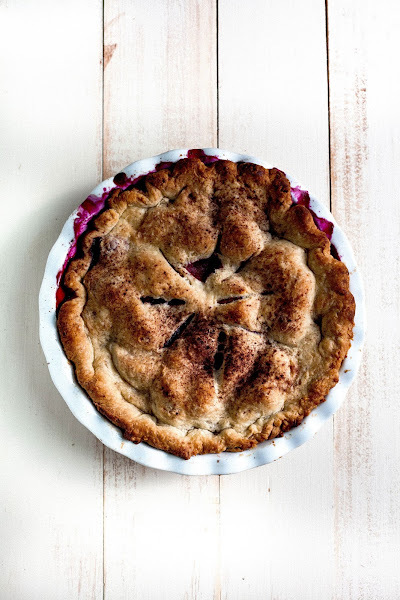 I remember starting out with a simple pie crust recipe — a recipe listed at the top of Google’s search results, I’m sure — before failing miserably and eventually just resorting to store-bought pie crust and some crumble topping. It wasn’t much of a pie, especially since it was filled with canned peaches and off-season blackberries. It also didn't hurt that, a few days ago, my friend Noah had just walked me through is pie crust recipe. Watching Noah bake pie was incredibly instructional and informative — it made me realize I need to start baking more with seasoned bakers. Normally, my baking jobs are a solo gig in the kitchen. Erlend can attest to this — I'm a bit of a control freak when the baking process begins, so much that I don't even like to have him in the kitchen. But it turns out that when it comes to pie, contrary to what I believed before, control and hyper-attention to details is kinddaaaa unnecessary. I watched in fascination as Noah baked without a recipe, adjusting details as needed. Pie dough still too soft after the chilling process? No problem, use more flour when rolling it out! Fruit filling looking a little too liquidy? Throw in a couple tablespoons of flour and cornstarch, and you're good to go! The pie that eventually came out of the oven was a little bit lumpy and had an overall rustic appearance, but the flavor was impeccable. Its crust was delicate, flaky and buttery — everything a pie crust should be. Indeed, Noah is a champion pie maker — there's even a rumor going around at his old college that he won a pie-making competition in Alaska that earned him the title of "Alaska's Best Pie Maker". Unfortunately, Noah has denied the truth of these rumors, but his pies are so good that it's easy to believe that the rumor's true. I'm hoping that this blackberry and peach pie — using his famous pie crust recipe — is a worthy homage to his own delicious pies. It turns out that the secret to a good pie crust is... vodka. Who would have thought! After reading a Cook's Illustrated recipe that used vodka in its recipe, Noah decided to sub a couple tablespoons of water with vodka. The theory behind this is that the vodka doesn't promote gluten formation, so it helps the crust stay much flakier and more tender. Do NOT skip the vodka in this recipe — it's essential to the texture of your pie crust. Noah's a firm believer of making the dough for the bottom of the pie crust and the dough for the top of the pie crust (that is, what covers your fruit filling) in two batches. He thinks that doing it this way promotes an even crust and texture throughout the pie. So if you want to make a pie with both a top and bottom crust, be sure to make two batches of the pie crust recipe I'm providing. The temperature of ingredients is especially important in this recipe; be sure to use cold ingredients when you're instructed, otherwise your pie dough will be really, really, REALLY difficult to work with. I always thought flouring your counter with a light dusting of flour before you roll things out was the way to go — FALSE. Generously scoop tablespoons of flour to your work surface; I think I ended up using a quarter cup of flour when rolling out my dough. You can adjust more or less depending on how soft your dough is after its chilling process. Similarly, pay attention to your fruit filling. If it's too liquidy, it will get even more liquidy in the baking process so add an extra tablespoon of flour and cornstarch here and there. 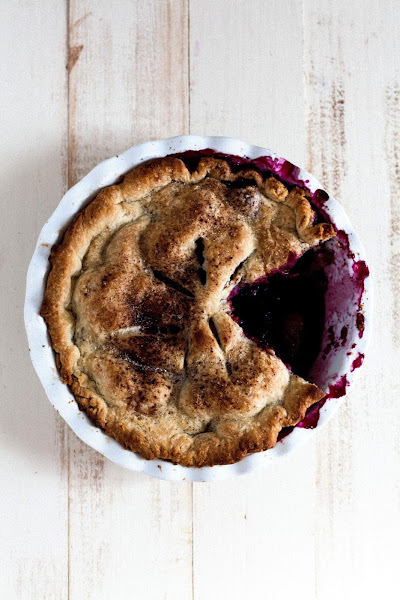 I actually made the mistake of not using enough flour and cornstarch in my blackberry and peach filling — my pie ended up a little too liquidy. I've adjusted the recipe to accommodate for my mistake, but definitely use your judgement since the flour/cornstarch quantities will vary depending on how ripe your fruits are. In a medium bowl, whisk together 1 1/8 cups all-purpose flour, 1 teaspoon granulated sugar, and 1/4 teaspoon salt until well combined. Add 1/2 cup cold, cubed unsalted butter and use a pastry cutter to incorporate into the flour until the butter has incorporated completely and has been reduced to pieces no larger than a pea. The end mixture should have a texture similar to cornmeal. Sprinkle 3 tablespoons water and 2 tablespoons vodka over the mixture. Use a rubber spatula to gradually gather the mixture into a ball; if the mixture seems dry, add another 1/2 tablespoon of vodka. When you can make the mixture into a ball with your hands, do so. Wrap in plastic wrap, flatten into a small disk, and refrigerate the dough for 45 minutes. Once the dough has chilled and has the texture and consistency of saltwater taffy, it's ready to be rolled. Liberally sprinkle a work surface with flour — I used around 1/4 cup's worth. Unwrap the dough and place it on the work surface, sprinkling its top with flour. If the dough is hard, let it rest for a few minutes. If the dough seems too sticky at first, add flour liberally. Use a rolling pin to roll with light pressure, from the center out. Roll the the dough to about 10 inches in diameter and about 1/4 inch thick (place your pie plate upside down over it to check its size). Move the dough into the pie plate by folding it into quarters, then moving it into the plate and unfolding it. When the dough is in the plate, press it firmly into the bottom and sides of the plate. Transfer it to the refrigerator to chill while you make the filling. Repeat the recipe to create the top pie crust layer, keeping the dough unrolled and in plastic wrap until ready to use. 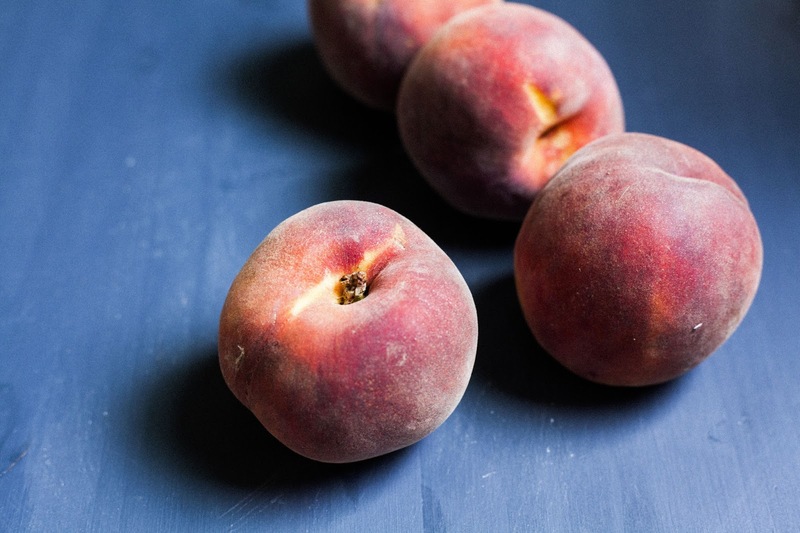 In a medium bowl, combine 1 pint blackberries, 2 medium-large peaches cut into 1-inch pieces, 3 tablespoons granulated sugar, and 1 tablespoon rum. Let sit for about 10 minutes, before adding 2 1/2 tablespoons cornstarch and 1 tablespoon all-purpose flour (or more, see baker's notes) and gently tossing. Before transferring the filling to the bottom pie crust, prick it all over with a fork. Transfer the filling to fill the crust, making sure that the fruit is evenly spread throughout the pie (or you'll end up with a lumpy, rustic pie like I did). Roll out the top layer of the pie crust to a rough circle about 10 inches in diameter and about 1/4 inch thick. Fold the dough into quarters, move to the top of the fruit, and unfold it. Pinch the excess edges of the bottom and top layers of the pie together to seal the pie. Crimp the edges using your fingers or a fork. Use a knife to cut 6 slits in the top crust to allow steam to escape. Sprinkle the top of the pie with 1 tablespoon granulated sugar. Bake in the preheated oven for 40 minutes, or until the crust is brown and the juices are bubbling. Once the pie has finished baking, transfer to a wire rack and let cool for an hour. Garnish with 1 tablespoon ground cinnamon. Beautiful. I love pie and pie crusts. I've never thought to use vodka... but, that would certainly keep the chill! I'll have to try it! This pie looks GORGEOUS - like the platonic ideal of pie. I would take a big greedy slice. The pie looks so good. Pie is one of those desserts I avoid also. For some reason I am not good at making pie crust. I've never heard of using vodka in a pie, what a secret! We just made this this weekend and it was excellent. The crust was very, very good. This is such a good recipe that I believe you could substitute other summer fruits (blueberries, raspberries, cherries, etc) and it would work well. Thanks for the recommendation! I wonder if that's why my pie crust turned out a little lumpy looking. 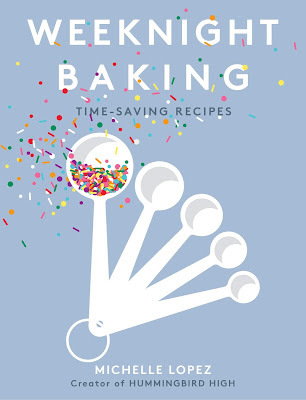 I'll definitely give this a shot the next time I bake the pie. The pie looks gorgeously lumpy. I use vodka in one of my pie dough recipes. The alcohol evaporates making for the perfect flaked crust and it is an excuse to have some vodka on hand.